The most popular herbal remedies in the health food industry are those which promote bowel movement. The reason is quite simple since the most common problem of so many individuals is constipation and bowel irregularity. Consider how tremendously valuable a formula is that not only regulates bowel movement but at the same time does the following: improves digestion, reduces serum cholesterol, improves circulation, potentates adrenergic function), contains 31% linoleic acid, exerts a marked cardio-protective effect, reduces high blood pressure, improves liver function, has proven anti-inflammatory and anti-viral properties, expectorant, hypertensive. Sound like a panacea? Well, it is practically just that. Triphala, as it is called, is the most popular Ayurvedic herbal formula of India, since it is an effective laxative which also supports the body's strength. The constitution of vegetarian Hindus cannot tolerate harsh laxatives anymore than vegetarians in other countries. Because of its high nutritional value, Triphala uniquely cleanses and detoxifies at the deepest organic levels without depleting the body's reserves. This makes it one of the most valuable herbal preparations in the world. How is Triphala different from other kinds of laxatives? There are two primary types of herbal laxatives. One is called a purgative and includes herbs such as senna, rhubarb, leptandra, buckthorne and cascara. These often contain bitter principles in the form of anthroquinones which work by stimulating the peristaltic action of the intestinal lining, either directly or by promoting the secretion of bile through the liver and gall bladder. The second type of laxative is a lubricating bulk laxative, including demulcent herbs such as psyllium and flax seed. This is more nutritional and usually does not have any significant direct effect on either the liver or the gall bladder. Rather, these work like a sponge by swelling and absorbing fluid, thus acting as an intestinal broom. Triphala combines both nutritional as well as blood and liver cleansing actions. It has little function as a demulcent or lubricating laxative, however. It possesses some anthroquinones which help stimulate bile flow and peristalsis. The nutritional aspect is more in the form of its high vitamin C content, the presence of linoleic oil and other important nutrients which it makes more of a tonic. People who are in need of purgatives are those whose bowel irregularity is caused by liver and gall bladder congestion usually accompanied by some degree of blood toxins. Those in need of demulcent laxatives are those with intestinal dryness caused by a variety of metabolic factors including a nutritional deficiency as well as a condition of excess hyper metabolic energy. 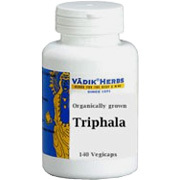 Triphala will prove useful for all kinds of constipation except that caused by a lack of vital energy or chi. Even for the latter type, it will not further deplete such an individual and can be made to work well if it is combined with other chi, blood or yang-warming tonic herbs such as ginseng for chi tonification, tang kuei for blood tonification and prepared aconite for yang tonification. Herbal healing is largely a matter of strategy. One approach may emphasize tonification while another emphasizes elimination. The problem with overemphasizing tonification is that it can lead to further stagnation and congestion in an excess condition. Emphasizing elimination through the overuse of purgatives in an already deficient individual can further deplete the body's store of minerals and essential B vitamins as well as imbalance beneficial intestinal micro-organisms. The result is weakness with a likely tendency towards chronic fatigue and anemia. Since the body is always simultaneously involved with maintaining and gaining strength through good nutrition as well as eliminating waste, Triphala is unique in that it is naturally able to support both vital processes simultaneously. Because of its high nutritional content, Ayurvedic doctors generally do not regard Triphala as a mere laxative. Some of the scientific research and practical experience of people using it down through the ages has demonstrated that Triphala is an effective blood purifier that stimulates bile secretion as it detoxifies the liver, helps digestion and assimilation, and significantly reduces serum cholesterol and lipid levels throughout body. As a result, it is regarded as a kind of universal panacea and is the most commonly prescribed herbal formula. A popular folk saying in India is, No mother? do not worry so long as you have Triphala. The reason is that Indian people believe that triphala is able to care for the internal organs of the body as a mother cares for her children. Each of the three herbal fruits of Triphala takes care of the body by gently promoting internal cleansing of all conditions of stagnation and excess while at the same time it improves digestion and assimilation. We herbalists believe that the longevity and innate power of herbs such as those of Triphala are, when ingested, energetically absorbed and imparted to our reserves. This belief exists with herbs such as wild ginseng, where specimens that have weathered decades of climatic stress have been found to contain the highest concentration of ginsenosides. The Ginkgo tree is another of those long lived plants whose evolution extends back over millennia to the time of the dinosaurs. The three fruits of Triphala (Harada, Amla and Bihara) each corresponds to the three humors or tridosha of Indian Ayurvedic medicine. According to Ayurvedic theory, the body is composed of three doshas or humors. Vata is sometimes translated as wind which corresponds to the mind and nervous system. Its nature is dry, cold, light and activating. The second is pitta which is also translated as fire or bile. It is responsible for all metabolic transformations including the digestion and assimilation of food as well as assimilation and clarity of thought and understanding. The nature of pitta is primarily hot, moist and light. Kapha is sometimes translated as the water or mucus humor and is responsible for all anabolic or building functions such as the development of muscle and bone tissue. Its nature is cool, moist and heavy. Harada, having a bitter flavor, is associated with the vata humor as well as the air and space elements. It treats imbalances and diseases of the vata humor. Harada possesses laxative, astringent, lubricant, ant parasitical, alterative, and antispasmodic and nervine properties. It is therefore used to treat acute and chronic constipation, nervousness, anxiety and feelings of physical heaviness. Among Tibetans, Harada is so highly revered for its purifying attributes that it is the small fruit that is depicted in the hands of the medicine Buddha in their sacred paintings or tankas. Of the three fruits, Harada is the most laxative and contains anthroquinones similar to those found in rhubarb and cascara. Amla has a sour flavor and corresponds to the pitta humor and the fire element in Ayurvedic medicine. It is a cooling tonic, astringent, mildly laxative, alterative, and antipyretic. It is used to treat fire imbalances that include ulcers, inflammation of the stomach, intestines, constipation, diarrhea, liver congestion, eruptions, infections and burning feelings throughout the body. In various studies, Amla has been shown to have mild anti-bacterial properties, pronounced expectorant, anti-viral and cardio tonic activity. Amla is the highest natural known source of vitamin C.
Having 20 times the vitamin C content of an orange; Amla is also uniquely heat stable. Even when subjected to prolonged high heat, as in the making of the Ayurvedic tonic formula called Chyavanprash, Amla, as the primary herb comprising 50% of the formula hardly loses any of the vitamin C that is present when it is freshly harvested off the tree. The same is true of Amla that has been dried and kept for up to a year. This age and heat stable form of vitamin C in Amla is due to the presence of certain tannins that bind and inhibit its dissipation. Bihara is astringent, tonic, digestive and anti-spasmodic. Its primary flavor is astringent and the secondary is sweet, bitter and pungent. It targets imbalances associated with the kapha or mucus humor, corresponding to the earth and water elements in Ayurvedic medicine. Specifically Bihara purifies and balances excess mucus, treats asthma, bronchiole conditions, allergies and hiccoughs. Ama is a term denoting a substance associated in Ayurveda with chronic disease patterns and symptoms of aging. It is described as a kind of sticky buildup of material that clogs the circulatory channels. In many ways it is nearly identical to the accumulation of excess cholesterol and blood lipids described in the West. Both conditions seem to contribute to a wide variety of circulatory disorders ranging from senility, rheumatic conditions, abnormal cell growth and heart disease. It is interesting that in Traditional Chinese Medicine there is also a pathological condition associated with the heart called invisible mucus that is similar to the descriptions of both excess cholesterol and ama in Ayurveda. One of the body's reactions to coping with stress is to increase the production of corticosteroids. The accumulation of these stress hormones can also contribute to the formation of cholesterol. Internal stress and the resultant buildup of cholesterol can be caused by the abuse of stimulants, spicy, hot foods such as garlic and cayenne, excessive aerobic exercise and repression of the emotions. It is interesting that an excess of some of those very substances and activities that lower cholesterol in some, when not utilized in a holistic, balanced manner, can act as a stimulant and add further stress that would precipitate the further accumulation of cholesterol. Triphala is one of two Ayurvedic formulations that are specific for eliminating Ama and cholesterol from the body. Triphala is a completely balanced energetic formula, being neither too cold, nor too hot. When taken regularly over a long period, it gently effects the elimination and purification of Ama from the tissues of the entire body. The three fruits have been scientifically studied and confirm some of its known traditional benefits. These include the lowering of cholesterol, reducing high blood pressure, benefiting circulation, improving digestion and regulating elimination without causing any laxative dependency. 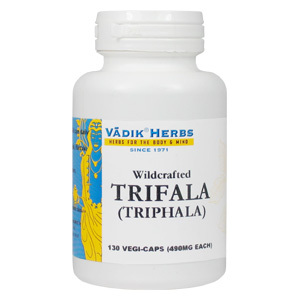 With all the virtues of the three individual herbs, Triphala has many wide and varied uses as a therapeutic herbal food. Before considering pathological indications for which Triphala would be appropriate, we should never ignore the value of taking it on some regular basis whether once daily or once or twice a week simply for health maintenance. Triphala, having great nutritional properties, will help to prevent sickness. Regardless of any other herbs used, Triphala can be prescribed singly or adjunctively whenever there are symptoms of inflammation, heat, infection, obesity and other conditions of excess. Because of its combined tonic and eliminative properties, it is generally quite safe to give even for deficiency diseases including anemia, fatigue, Candida, poor digestion and assimilation. Unlike other eliminative and cleansing herbs, Triphala is safely taken for symptoms of wasting heat that frequently accompanies diseases such as tuberculosis, pneumonia and AIDS. There are two ways to take Triphala, as a powder or capsule. Traditionally Triphala is taken as a churna or powder. One would stir in two or three grams of the powder with warm water and consume the entire amount each evening or divided into three doses throughout the day. Since for most it does not possess a flavor that one would look forward to experiencing, it is convenient that Triphala is available in capsule form. Generally the dose is from two to six capsules taken one to three times daily. Children may only require one or two capsules in the evening. The larger dose is more laxative while the smaller dose tends to be more gradually blood purifying. A smaller dose might be one or two capsules three times daily. One should increase or decrease the dose according to one's bowel movements. Since there are no problems in using Triphala, the dose can be adjusted upwards from the suggested amount. Triphala is also widely taken for all eye diseases including the treatment of conjunctivitis, progressive myopia, the early stages of glaucoma and cataracts. For these conditions, it is taken daily both internally as described above, as well as externally as an eye wash. Steep one tablespoonful of the powder or six capsules in an 8 ounce glass of water overnight. In the morning, strain the infusion through a clean cloth. The resultant tea is used to sprinkle over the eyes or used in an eyewash in an eyecup that can be readily purchased at most drug stores. Taken in this way for at least three months, Triphala becomes an herbal eye tonic. As stated, there can be different reactions to the same dose of triphala. For some it causes too loose bowels while in others it may have little or no effect. As a result, it may take two or three days to regulate the dose that is best. After the constipative tendencies are removed, usually within 15 days of daily application, it will no longer cause loose bowels. In India, Triphala is considered the greatest and most versatile of all herbal formulations. With the presence of such a vitamin C rich herbal food as Amla, it possesses unique nutritive tonic and eliminative properties. Both the public and therapists of all disciplines should be able to benefit from its unique therapeutic virtues. Trifala is shipped in a discrete, unmarked package. Orders are processed immediately and usually take about 3 to 5 working days to be received. Any information received is used only for order processing and shipping purposes. Your information, such as e-mail address, will never be disclosed to a third party.